What is the composition of this Namenda drug? If you wish to buy Namenda online then you should be aware of its contents. It contains active ingredients as memantine HCL and the inactive ingredients as microcrystalline cellulose/colloidal silicon dioxide, croscarmellose sodium, talc, and magnesium stearate. There is also an oral solution of this drug present that contains inactive ingredients as sorbitol solution (70%), Propylparaben, Ethylparaben, glycerin, propylene glycol, citric acid, natural peppermint flavor, sodium citrate, and purified water. What is the action mechanism of Namenda drug? This drug is indicated for use to treat severe confusion known as dementia that is related to Alzheimer’s disease. This drug is not a cure for the problem of Alzheimer’s disease but this can treat it to some extent by improving the memory making it more aware and an ability to perform daily activities better. This blocks the glutamate substance from reaching the brain as this substance is believed to grow the symptoms of the Alzheimer’s disease. What to know before taking the Namenda drug? Do not buy online Namenda drug before consulting your doctor if you are suffering from or have suffered from seizures, suffered from the problems of passing urine, suffered from bladder or kidney problems, suffering or had liver problems or any other medical conditions in the past. Do not take this medication without consulting the doctor if you are pregnant or plan to become pregnant. It is not known if this medication will harm your unborn baby or not. Consult the doctor if you are breastfeeding or plan to breastfeed as it is not known if NAMENDA passes into the breast milk. Inform your doctor about any medicines that you are taking whether prescribed or non-prescribed herbal or non-herbal at least taken in last 14 days. If you are suffering from any problem of urinary tract infection, kidney problems or if you had a change in the diet from your non-vegetarian to vegetarian diet then you should definitely tell your doctor. 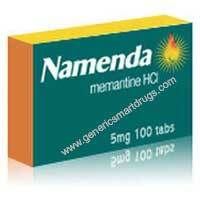 Buy online Namenda drug after the proper prescription from the doctor and the knowing the exact dosage structure. This drug can be taken with food or without food as directed by the doctor. Normally to avoid any outbreak of side-effects this drug is suggested to be started from the lower dosage. Normally the dosage varies according to the response to the treatment and the medical condition of the patient. This drug can be taken with or without food daily and should be taken with the help of water and should be swallowed as a whole. Take the medication as instructed by your doctor. Normally the prescribed dosage is 20 mg per day, which can be taken as two separate doses of 10 mg twice in a day one in the morning and other in the noon. In order to reduce the risk of side-effects, the 20 mg dose will be increased gradually, depending on the person’s response to the treatment. The recommended time interval between increasing the dose is one week. Do not change the dose of the medication, till the doctor has asked you to you to do. Do not chew the medication rather take it whole with a glass of water. Do not stop taking this medication abruptly rather it needs to be confirmed by the doctor about how to change the medication dosage. You need to inform the doctor if you see any abnormal allergic reaction. You can continue to take this medication till you do not find any issues with your health. What to do in case of missed dosage? Do not use any pills of this drug if it is damaged or shows signs of any tampering. If you have forgotten to take any dose of NAMENDA, do not add on to the next dose. You should only take a scheduled dose. If you have forgotten to take this drug for several days do not take continue the dose till you meet or consult your doctor. This has still not been confirmed about what will be the problem of overdosage still you can call the health center if you find any trouble or nearest health clinic or you can also call the poison center. But this should not be taken along with alcohol or with any other antidiabetic medication as these have shown serious problems of agitation, bradycardia, asthenia, confusion, coma, ECG changes, dizziness, increased blood pressure, lethargy, loss of consciousness, psychosis, stupor, unsteady gait, visual hallucinations, vertigo, vomiting, restlessness, slowed movement, somnolence, and weakness. What are the side-effects of this Namenda drug? Normally the side-effects of this drug are not well known but the most common side effects of this drug dizziness, confusion, headache, constipation. These may include hypertension (high blood pressure), vomiting, anxiety, confusion, hallucinations and disturbance in sleep. If you are suffering epileptic seizures then there are very fewer chances of this drug to increase the problem. What is the process of storage of this medication? Store NAMENDA at room temperature between 59°F to 77°F (15°C to 30°C) and keep this medication out of reach of the children. How to buy Namenda medication online? If you wish to order Namenda online you can obtain a doctor’s prescription after you have been confirmed with the Alzheimer’s disease then you can order for this medication. You should not give this medication on your own to anyone who is suffering from a similar problem till that person gets it prescribed by the doctor.